In all our training programs, there is a clear theme and structure. We think it is important that participants in our training programs can apply their new skills and knowledge as soon as they are back to work. 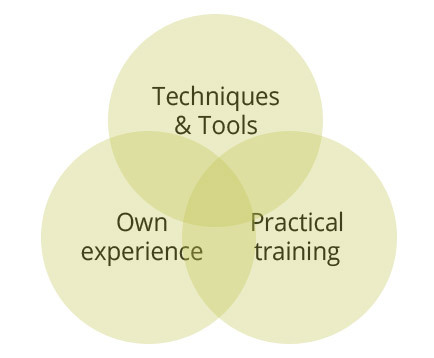 Therefore, all our training programs are built on three cornerstones that together give the best result. By this we create the conditions and the basis for a professional work. We provide various methods and techniques and give the participants relevant tools, which can quickly be implemented in their daily work. We believe that the best solutions for future challenges often are based on your own experience. During our training we give many opportunities to share experiences and thoughts, to share success stories and failures. Through this we create a clearer picture of how the techniques and tools can be applied. In order to improve your skills, practice is a must. Our training programs include many role plays and other practical exercises that are directly related to the participants’ everyday work. This will give a fast learning and sustainable skills.